ROCKY MOUNTAIN AUDIO FEST, DENVER, CO, OCTOBER 4, 2018 -– NAD Electronics, the highly regarded manufacturer of high-performance audio/video components, debuted a unique product that combines a quality Preamplifier, DAC and BluOS streamer all in one. The C 658 integrates the latest technologies such as BluOS, Bluetooth aptX HD, Dirac Live Room Correction and Modular Design Construction with a time-honoured approach to audio for which NAD has become famous. The C 658 will be $1499 MSRP U.S. when it becomes available in December 2018. The C 658 is BluOS Enabled which means it boasts the most sophisticated High Res streaming system available. BluOS natively supports nearly 20 streaming music services and indexing of over 250,000 tracks from local network sources. In effect, the C 658 becomes a node in the BluOS ecosystem, allowing hi-res network streaming to 64 zones and control options for iOS, Android, Windows, and Mac OS phones, tablets and desktop devices. BluOS also supports all major smart home controllers and is available in a wide range of products making it easy and affordable to create a whole home audio system with the C 658 at its heart. With High Res digital recording and streaming, combined with advanced technology like MQA, record companies are opening their vaults and releasing Studio Master Quality recordings. MQA decoding is available on BluOS Streaming content. The C 658 features two-way wireless Bluetooth capability that is powered by aptX HD for the highest possible sound quality available. Users can easily stream music from smartphones, tablets and laptops or can also use its integrated two-way Bluetooth feature and effortlessly stream music that is playing on the amp to any pair of Bluetooth enabled headphones. aptX HD is becoming more and more popular for its remarkable sound quality and low power consumption compared to Wi-Fi. The C 658 employs Dirac Live® Room Correction software that delivers optimized sound quality for your home theatre system. The built-in Lite version of the software, with the option to upgrade to a full-featured version for $99 USD, measures the acoustic performance of the system within the listening room and optimizes playback performance to provide the most transparent music reproduction possible. The setup process is automated and very simple, giving users the control they need to precisely tune for the best results. With Dirac Live, you can build the perfect listening environment that corrects for both the timing and colourations in sound using the supplied microphone and its powerful software. The C 658 incorporates a unique feature called Modular Design Construction that is exclusive to NAD. Here is why it’s important. Performance-minded enthusiasts want to embrace the ever-changing world of AV technology while “future proofing” their original investment. So, NAD devised the most important innovation in a decade: Modular Design Construction – an uncommon answer to technology obsolescence. Digital audio and video circuits are on replaceable modules. With MDC, all major digital circuits can be upgraded and replaced to keep the unit forever young and capable. This NAD innovation is a unique architecture that keeps pace with the fast-changing world of technology. With MDC, the ability to easily upgrade a component to include future digital formats is totally unique and unprecedented. Though installation and setup of any MDC module is straightforward, consumers are encouraged to have this upgrade professionally installed by their authorized NAD dealer. 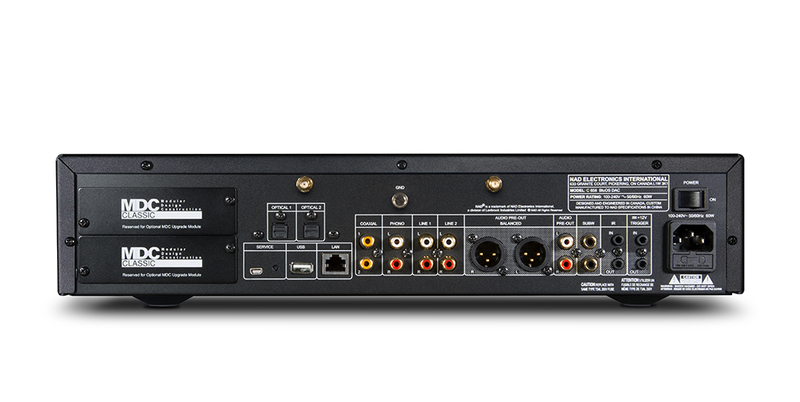 The C 658 comes with two MDC slots for future expansion. NAD designers didn’t forget traditional audiophiles by including a high-quality phono stage, analogue inputs, balanced preamp output and stereo subwoofer outputs and a dedicated high current headphone amplifier with a ¼” jack right on the front panel. CI enthusiasts will be happy to know that the C 658 has an RS-232 serial port with certification and chassis drivers forthcoming for Control4, Crestron, RTI, URC, and ELAN. NAD will be exhibiting at the RMAF in Denver, Colorado October 6-8, 2018. Along with sister brands PSB and Bluesound, they can be found in Room 8021 in the Tower and in A23 of the Atrium section of CanJam. MDC (Modular Design Construction) offers the ability to upgrade to future digital formats as they become available. Two MDC slots provided.